Click after the jump for a bigger version of the pic "Hunter In Dagobah" and more information. 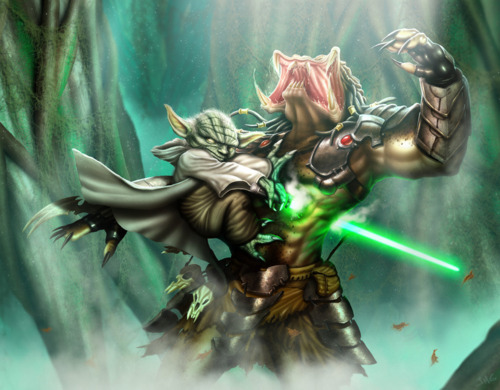 Check out this Star Wars/Predator mash-up entitled "Hunter In Dagobah" by Spanish artist Joshue Matamaros. You all know that Yoda don't play no games (the best part of Attack of the Clones was Yoda getting bizrock with his light saber), but here he dismantles one of the universes deadliest hunters with relative ease.